19/05/2017: 11 babies, day 23 of the gestation period. Freewild is a fabulous doe - the daughter of my heart rat Avanti. 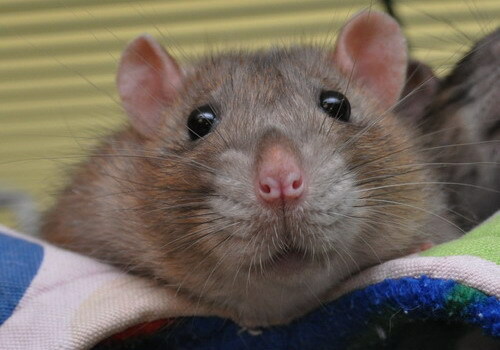 Shortly after she was born, I was hit by sendai virus following exposure at a rat show, and Freewild and her sisters thankfully survived (despite the virus claiming a large number of rats, including Avanti). She is a robust girl with lovely type and good colour, and above all she has a very sweet easy-going temperament with just the right dose of naughtiness! Tristan is a lovely broad buck who is active, busy and people-oriented. This litter is an inbreed on Avanti and I hope the parents will complement each other well and double up on all their good points. We are likely to get chiefly agouti, with good chance of dumbo and black. This litter will be homed jointly with the Sunastis. I plan to keep 2-3 does in total, with the remainder being homed to our waiting list. If you are interested in going on the list for future litters, please see the Homing page for more information.